Our Preformed Coin Wrappers are made of a heavy duty kraft paper and crimped on one end for fast easy use. These Cartridge Wrappers meet all Federal Reserve/ABA Standards and come 1,000 wrappers per box. Coin Wrappers are available in sizes for Pennies, Nickels, and Dimes. per 1,000. Was $29.50. Save 33%! 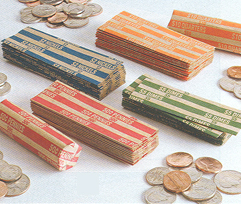 Our Flat Coin Wrappers are available in standard rolls of pennies, nickels, dimes, quarters, and dollars. Made of Heavy Duty Kraft Paper, Our Coin Wrappers pop open with a squeeze and can be filled by and or machine. Each box holds 1,000 wrappers of each denomination. Feel free to browse our other Money handling Supplies including Coin Trays, and our Coin Counter, Wrapper, and Bagger All-in-One Machines.